A 17 year-old teenager must’ve caught the Olympic fever, for the wannabe-diver thought he had what it took and decided to make a home video showcasing diving attempts. It’s just too bad his Olympic dreams made him end up at the hospital. Being a homemade video, and having limited, ahem, resources, the teenager from Jiangxi, China, decided that the Xinjiang Bridge, a 25m tall bridge (and 2.5 times higher than the tallest Olympic diving platform!) would suit perfectly. To put it into perspective, it’s about the height of an 8 storey building. So, being a seemingly big risk taker and a go-getter, he had the best recipe for disaster. One could only wonder what was exactly going through his head at that point? 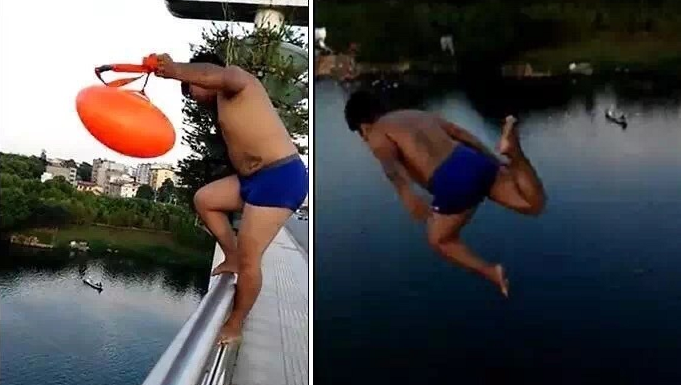 Because jumping off a 25m bridge is totally a great idea! Apparently, he landed in a belly flop and Chinese media mused how his performance was much like Malaysian diver Ahmad Amsyar Azman! After trudging out the water, the boy was immediately sent to the hospital. According to Sina, he sustained several thoracic fractures and lung injures. See folks, this is what happens when you try take shortcuts! Olympic divers may make it seem effortless, but it involves a mad number of hours gone into training!! So, as cliche as it is, don’t try this at home kids!